Food is the future. We envision a food secure community where everyone has access to healthy, local food raised with care and integrity. We work to support a robust food system that sustains producers, consumers, and our land. We believe in the power of food to connect, to unite, to heal, and to bring joy. In sharing our food stories, we connect more deeply to each other; when we share what food is to us individually, we join our voices for a stronger food system. Food is community. Join the conversation! On twitter, tag @sfclocal and use #FoodIs and tell us what food means to you. Look for more conversation on our Facebook page and visit our Food Is web page for more ideas. 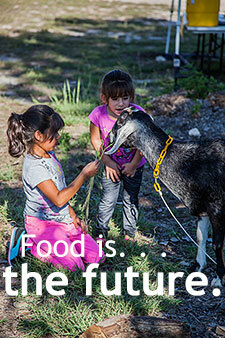 Given the recent media attention to urban farming in Austin, we posted this message on our blog. Join the conversation and stay informed – it’s about food sovereignty. We have a Meetup group! Join the SFC Friends of Food--we'll get together in person to share food, cook, garden, visit with local food visionaries, and learn about ways to get more deeply involved in the local food system from the ground up! We’ve reached an exciting milestone: after 6 years of operations, SFC’s Farm to Work program passed $1 million in sales on August 6, 2013. That’s a lot of fresh, healthy, affordable food on local tables! 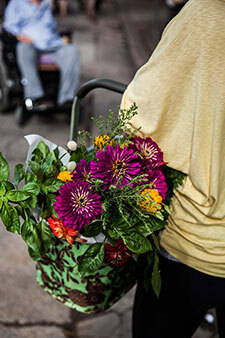 In October, the Double Dollar Incentive Program expanded to all SFC Farmers’ Markets! The Double Dollar Incentive Program allows families and individuals who receive Supplemental Nutrition Assistance Program (SNAP) benefits (formerly food stamps) and Women, Infant, and Children (WIC) fruit and vegetable benefits, to double the dollar amount that they can spend on fruits and vegetables at the East and Sunset Valley markets. Visit our website for more info. 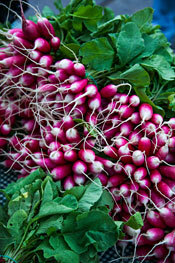 Want inspiration & new kitchen skills for all the beautiful local food you find at the SFC Farmers' Markets? The Happy Kitchen/La Cocina Alegre® is now offering classes in our new Teaching Kitchen! See our 2013 class schedule here. Class prices start at $20. Space is limited. Reserve now. Doggone it to Summer! Join us this Saturday October 26th at SFC Farmers’ Market Downtown for our annual goodbye to summer celebration with a doggie costume contest, parade, pet adoptions, and yappy hour with pupcakes! New this year: “Dogs of the Market: People’s Choice Award” photo contest. Enter by October 25th here for your chance to win a photo session for you and your pooch with a professional photographer. 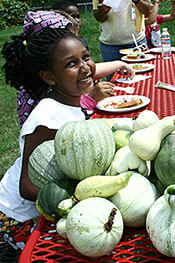 SFC knows that the safest, healthiest food comes from local farms, or maybe your own garden. The Food Safety Modernization Act could impose severe restrictions designed for big, industrial agriculture operations on our community’s family farmers. We have opportunity, and even a responsibility, to provide comments to the FDA about the proposed food safety measures in an effort to protect the viability of healthy food producers in our region. Click here to learn more about these proposed regulations and to take action! Saddle up, let’s ride! The Texas Mamma Jamma Ride raises awareness and much-needed funds for our central Texas neighbors coping with breast cancer. The event scheduled for Oct. 26th saves and improves lives by supporting SFC, as well as nine other local nonprofits providing supportive services in Central Texas. We hope you’ll consider donating or riding! North Austin Community Garden Groundbreaking! 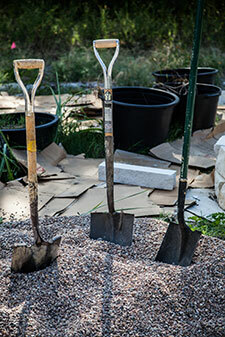 On Oct. 27, construction of the North Austin Community Garden will officially begin. Join us in celebrating this exciting project and learn about upcoming opportunities to participate! Program will include remarks from local design studio Thoughtbarn and the community-led Garden Leadership Group. Save the date for the Green Corn Fall Festival Sunday, Oct. 27th. You won’t want to miss this gorgeous day of food, music, and community supporting an organization that educates and assists Central Texans in growing organic food gardens. 2013 Chef Auction benefitting SFC & Urban Roots. On Nov. 21, join Edible Austin at The Allan House for tastings, hand-crafted cocktails and put your paddles up for the rare opportunity to have our city’s culinary elite cooking just for you and your guests! Tickets available here. Here’s an easy way to stay informed about local food policy! Add your email to the Sustainable Food Policy Board’s community email distribution list. Receive timely information about upcoming agenda items of interest and notices of working group meetings. Stay informed and come let your voice be heard! Mecca Gym and Spa is raising funds to support SFC's mission each month of 2013! In November 5% of all 80min massages and in December 5% of all hot stone massages sold benefit SFC!